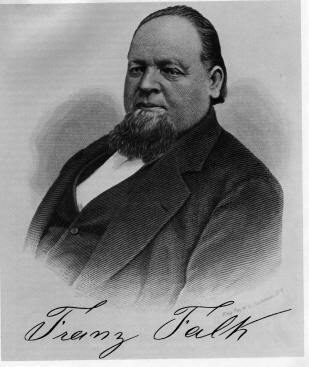 The founding grandfather of the Falk Corporation was born in August 9,1823 in Miltenberg, Bavaria Germany. (Also the birthplace of August Krug and Val Blatz) Entrepreneurial drive was not the only skill Franz Falk brought with him to make his niche in the New World. After 6 years spent mastering his father's trade, coopering, Falk added the "art and mastery" of brewing while employed by a Miltenberg brewery. In 1848, Franz Falk decided to make a new life for himself in America. Falk departed for the United States, reaching New York in June 1848. In October of 1848, after three months in Cincinnati, Falk relocated again to Milwaukee. With one third of the population German, Milwaukee was a favorable environment for brewers. All of Milwaukee's famous breweries- Pabst, Schlitz, Miller, and Blatz - were established in the 1840s. Franz Falk's timing could not have be better to find a brewing position. In the Cream City he was soon employed as a general brewery workman by August Krug, who founded the brewery eventually operated by Joseph Schlitz. After approximately six months Falk moved on to the Menomonee Brewery, working with Charles T. Melms for a seven year career as the brewery foreman, or brewmaster. The 1857-1858 Milwaukee City directory lists Falk as the brewery foreman of Melms & Co. This time frame is approximately when Melms took full control of the former Menomonee brewery, Franz Falk was ready to set out on his own. In mid to late 1855 Frederick Goes and Franz Falk formed a partnership and began to build a malting and brewing enterprise. The brewery portion was called the Bavaria Brewery, no doubt Falk's influence in the name. Goes was a successful dry goods businessman, the 1857-1858 Milwaukee City directory lists Goes as a variety store owner. If we read into the Goes & Falk name under which they did business, it's possible that Goes may have supplied the venture capitol, or perhaps an important asset for the venture. The record indicates that in 1856 Frederick Goes assumed ownership of the Middlewood & Gibson malt-house (3), originally established in Milwaukee in 1849 as the Eagle Brewery. (Later operated as the Sands Spring Brewery.) Goes and Falk leveraged the malting operation with their new brewery venture. The first Goes & Falk enterprise was located on 8th and Chestnut, now Juneau and Highland. The address is near the Eagle brewery, and although the final relationship between the properties and owners is unclear, it is possible that assuming part of the former Eagle Brewery and malt house facilities launched Goes and Falk's enterprise. In brewing history, 1856 was a year of turn over. Krug, Falk's former employer also died in 1856 allowing Schlitz to step up. During Falk's initial year, 1857, Goes & Falk employed five men and produced 1000 barrels.